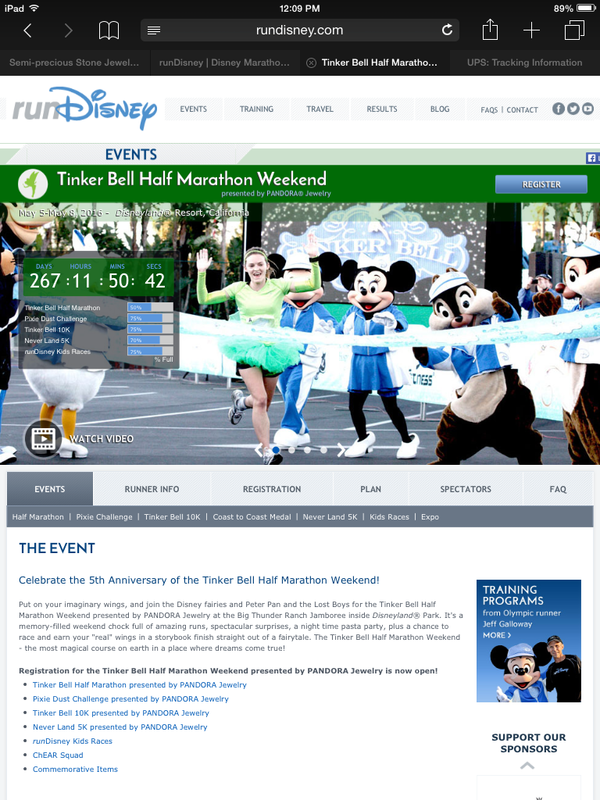 I was *so* excited yesterday to get an email from runDisney with a special early registration link for the 2017 Tinker Bell Half Marathon. As I’ve written before, this is probably my favorite race. The message said that in honor of being a legacy runner since the inception in 2012, there was a spot in the half marathon reserved for me. I could register before the masses (general registration opens September 20th) and simply had to click the link between September 12th and 19th. Wow. At first blush, this was awesome! 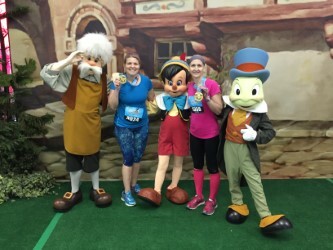 RunDisney races have become so popular that some sell out in minutes, and there are several blog posts dedicated to strategies to gain entry. From my experience of doing 15+ runDisney events, I’ve found that what works for me is to put several reminders on my calendar to get on the registration site about 5 minutes before registration starts, then frantically hit “refresh” until it does. The next step is to typically be placed into a queue until it’s my turn to register, which is when I type as fast as I can and hit “return.” I don’t exhale until I see the confirmation screen. While I usually get into the race I want (with the exception of you, Wine and Dine Half Marathon, grr! ), it’s always heart pounding and there are a few panicky moments when I watch the clock tick and think that this is the time that I’m not going to make it. 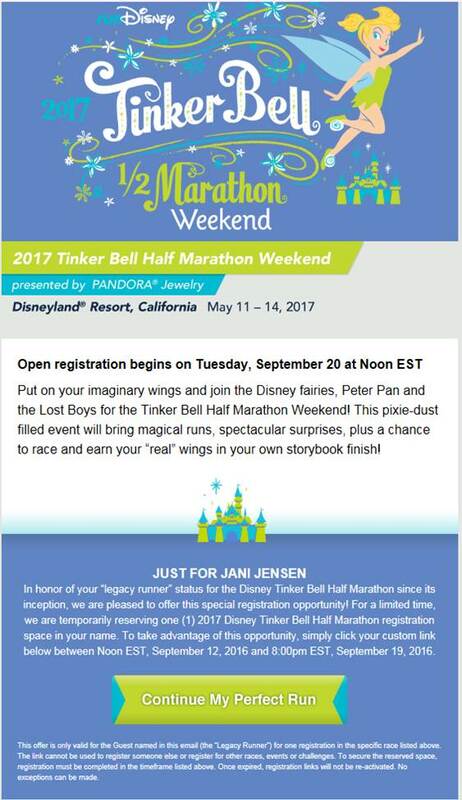 So, while I was excited to see this offer for the guaranteed half marathon spot, what I really, really like about the Tinker Bell series is the Pixie Dust Challenge, which is a two day event consisting of a 10k on Saturday followed by the half marathon on Sunday. And my special link was for the half marathon only. In the end, I hemmed and hawed for a few minutes but bit the bullet and registered. I’ll probably still try to get into the Pixie Dust Challenge next week and if that works out, I’ll query runDisney regarding a refund. Either way, I’m running! Excited. 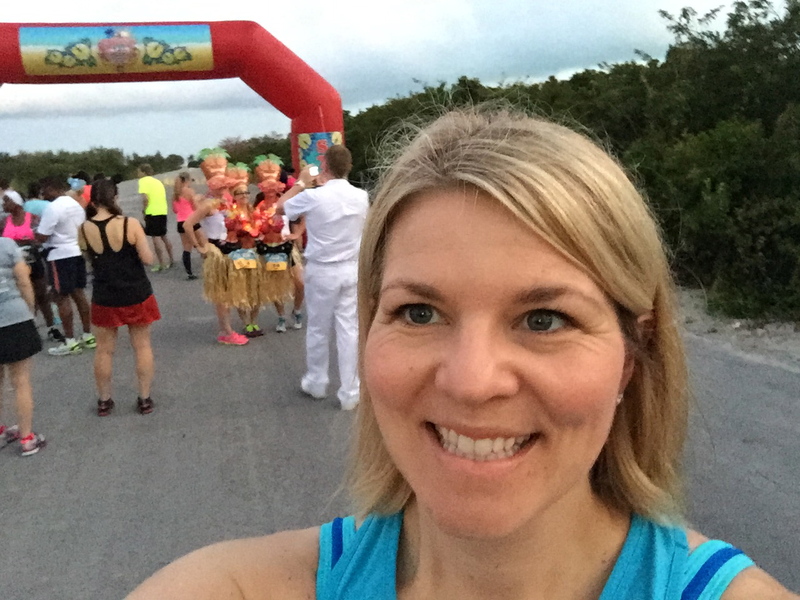 When I left off last fall, I was headed on a complicated trip that took me to the 2015 Wine and Dine Half Marathon via a whirlwind trip to Dubai, which was not the most convenient – or relaxing – pre-race preparation. Spouse was running this with me and we were slated to meet in Orlando on Saturday morning, with the race starting Saturday night. I had two flights to get there: a 17+ hour one from Dubai to Atlanta (in coach, ugh) and then a quick 90 minute jump from Atlanta to Orlando. The first leg was miserable; I was cold, uncomfortable and could not sleep. Thankfully I wore compression socks to reduce some in-flight leg swelling, but I was still pretty cashed once I deplaned. After a quick shower and some major teeth brushing for me, we hit the expo, which was also pretty cashed. I’m usually not big on buying official race merchandise, which is a good thing because there was none left at this point. The rest of the day involved a nap and waking up to head over to the race start. We were staying at the Swan Hotel, which was not one of the hotels offering transportation to the starting line, but it was easy enough to walk next door to the Boardwalk, which was. We arrived around 7 PM and the bus lines were long. After waiting about 30 minutes, we boarded and headed to ESPN Wide World of Sports. Bus traffic was also crazy; there were traffic jams and the ride took about 30-40 minutes. The conditions when we left the resort were hot and humid, but by the time we got off the bus the temperature had dropped several degrees and the wind had picked up. There was lightning in the distance and I had a bad feeling about the race. Let me also say that at this point, I was not feeling too hot. Even after a nap I was still exhausted from the travel. My legs felt heavy. I knew the race was going to be a push for me to complete. 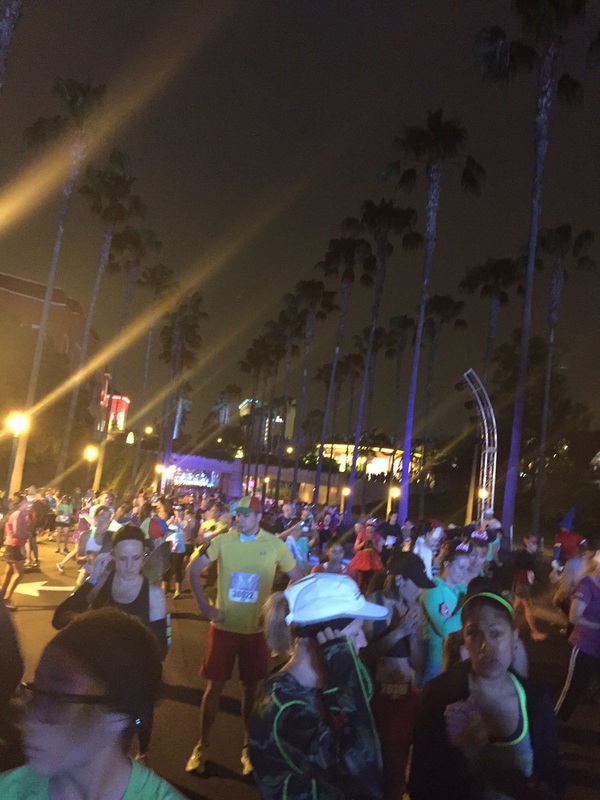 I was focusing on Getting It Done and making it to the famed after party where racers can enjoy EPCOT until 4 AM. We then started to see people moving from the grassy starting area towards the ESPN stadium. Tweets were coming out that the race was being delayed due to weather. We slowly walked with everyone else into the stadium, where we were officially on hold. As more than an hour of limbo ticked by, I started to think that Run Disney would either need to cut the distance from 13.1 miles to something less or entirely cancel the race. There was no way all of the runners could complete the course AND get to the after party with enough time to enjoy it by 4 AM. Standing between hangry runners and the Wine and Dine Expo was not going to work. Finally the announcement came that we could head out to the corrals. Spouse and I were in different ones. I had submitted a proof of time and was in corral D; he did not and was in the last one. Once in the corrals, there was an announcement that indeed, the race was going to be cut to a shorter distance. If they announced the shorter distance, I didn’t hear it, but in the end my watch said that we had done 6.75 miles, so this became a Half Half Marathon. Personally, my exhausted legs and I were ok with this turn of events. Many, many other runners were not. Since I was fairly early in the corrals, I didn’t get caught up in a lot of foot traffic, but Spouse did. I think I finished in about 1:07. I waited for him at the finish and he crossed nearly an hour later. His corral started about 40 minutes after mine, which accounted for most of the time but he also reported areas that were so congested he had to walk. We’d taken advice from a lot of other bloggers and brought fresh clothes for the party. By the time we hit EPCOT it was after 1 AM. Neither of us was particularly hungry, which was good since the lines at most of the booths were loooooooong. We both had an artisanal wine and cheese plate and I had a sushi roll from Japan, while Spouse waited in line to get a beer and something from Germany. We made it to nearly 4 AM and were able to walk back to the Swan Hotel via the International Gate, and then we promptly collapsed. The one thing that I did right about this trip was to NOT return home on Sunday; we gave ourselves an extra day and came back on Monday. On Sunday we slept late, ate lunch and spent a leisurely day together, followed by dinner at Il Mulino. 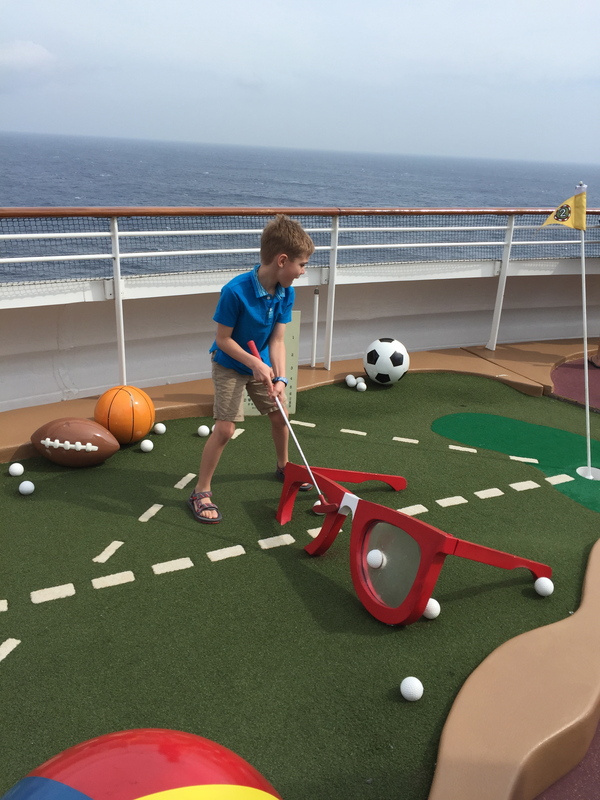 We came home on Monday without a hitch. Considering everything, would I do the Wine and Dine again? Probably. However, if you follow Run Disney events you would know that they’ve changed it to a morning race and added a 10k, plus a 10k/half marathon challenge option. It’s also a moot point for this year since I was shut out of the 2016 registration, which filled with lightning speed like always. 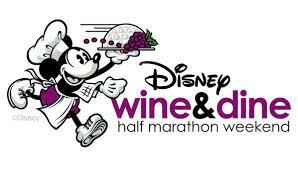 Ironically, I have less to say about the 2016 WDW Marathon than the Wine and Dine, even though it was essentially four times the distance of the latter. 2016 was my fourth time on the course, but it was my friend L’s first marathon and that made it really special. The week leading up to the race held an unexpected event for me: my 94-year-old grandmother died. I spent most of the week helping with arrangements and then attended the funeral in Wisconsin on Thursday. L. and I met up in Orlando on Friday – two days before the race – and hit the Expo. Most of it was the same as before except that we had to go to a different area outside the stadium to pick up our wristbands for the Race Retreat (side note: whenever possible, spring for the Race Retreat; it’s totally worth it). On race day we were up and out the door before 3 AM. Transportation was smooth and we waited in the Race Retreat tent until it was time to head to the corrals. Even though it was her first marathon, L. had posted some amazing half-marathon times and was placed in corral D. I was in G, so we split up at the start and before I knew it, we were off. I knew this wasn’t going to be my best marathon (it turned out to be my second worst), especially since the week leading up to the race was really stressful. I took a short walk break after 8 miles and then spent the rest of the race taking unscheduled walk breaks every 30 minutes or so, usually for about two minutes at a time. I did a lot of bargaining with myself to get to the next mile, run through one more song on my playlist, etc. Eventually I reached Hollywood Studios, which is my favorite part of the course. The last five or so miles of this race always seem to go quickly for me, especially since the crowd support along the Boardwalk is so strong. I rounded my way through EPCOT and crossed the finish line in 4:59, which took a push at the end to squeak in under the five hour mark. As I mentioned above, this was my second-worst marathon time. (Worst was my second marathon, which I trained for while I was postpartum and completed when my daughter was less than eight months old; the finishing time was 5:03). This was also my ninth marathon, so I am not new to this rodeo. While I am a lot older than I was the first time I did this race (January 2006; 4:24), I also determined that I need to get leaner and train differently to improve my running. This is something I’m working on now. L. was more successful in her race. L. and I met up in the Race Retreat tent after we finished. Due to her faster time and earlier corral placement, she’d been done for about 45 minutes by the time I staggered in. After a ten minute massage and a giant plate of breakfast, I was feeling like a human again and we headed back to the Swan Hotel, where we were staying. L. showered and left less than an hour later, so I was now on my own. One really interesting thing happened: I got to see the end of the race. From the hotel balcony I had an eagle eye view of the course, right where the path leading from Hollywood Studios crosses the bridge to the Swan and Dolphin. There were still a lot of runners out there, and I decided the best thing I could do was to go down and cheer them on. I think this was the first time I’ve been a spectator, not a runner, at a race. It was so much fun. I was waiting to see the legendary Balloon Ladies (the last people to start the race and the pacers for the course cut-off), but I missed them. 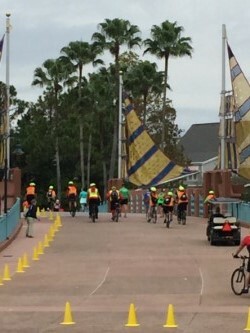 I did see the course close as bikers and Disney people put cones across the path. 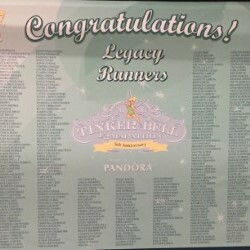 My final recap is the 2016 Pixie Dust Challenge, which is part of the Tinkerbell Half-Marathon weekend. This is absolutely one of my favorite races and something I look forward to every year. 2016 was the fifth anniversary of the event, and I was in the Legacy Runner group. A list of the Legacy Runners that was at the Expo – and I’m on there! Being a Legacy Runner gave me a special bib and a gift, which was a small mirror. I was oddly touched by it all. I’d also forgotten that I’d sprung for a warm-up jacket when I signed up – a departure from my usual avoidance of buying official race merchandise ahead of time, which I consider a bad omen because I am superstitious like that – so I was pleasantly surprised to receive it at the Expo. It was soft, fit like a glove, and I wore it several times during the weekend and since. 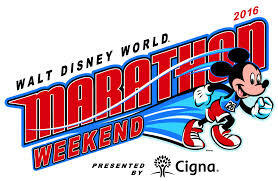 For the Pixie Dust Challenge, there is a 10k on Saturday followed by a half marathon on Sunday. This year I was staying at the Sheraton, which is about a 15 minute walk from the starting line (one of the reasons I love this race is the easy accessibility of the starting line, as well as the many real bathrooms to use pre-race). When I woke up on Saturday morning, it was raining. Not just sprinkling, this was full-on rain. I scratched my plan to walk to the starting line and decided to take the shuttle bus. This almost turned out to be a huge mistake. After waiting with several other runners for 20+ minutes for the bus, it finally arrived and we were dropped off on the far side of the park. There was still at least a 10 minute walk to the starting line from there. Fortunately, the rain had cleared by then so I was able to stay dry, but I reached my corral (B) right as the Star Spangled Banner was being performed. This was a bit too close for comfort. The race had a slow start. Many runners were cautious on the still-wet pavement and I had a hard time getting through congestion for the first 1.5 miles. My usual 10k goal is to finish in less than an hour, but I wasn’t sure that I would make it due to the slowdowns. At the three mile mark, though, my watch said 32 minutes and I decided to push it to the end. I finished in 59 minutes and change, so this worked out. Conditions were much better on Sunday. I was still doing some bargaining in my head. I decided that it would be ok if I walked a bit, but I needed to steadily run at least the first half of the race. When I got to the six mile mark, I also knew that there was a really boring part of the course coming up from miles six to nine. I was feeling ok and decided to keep going until mile eight and then consider a walk break. When I got to mile eight, I discovered that the Red Hat Ladies and their awesome crowd support were stationed there this year instead of in their usual spot outside of Downtown Disney. These ladies gave me quite a boost and I quickly went through miles eight and nine. At mile 10.75, I decided that I would take that walk break, so I did for about three minutes. Next I decided that I would take short breaks in miles eleven and twelve, but when I reached 11.75, I felt good enough to skip them and kept soldiering on. I finished in 2:09, which is also not my best half (1:54) but not my worst. 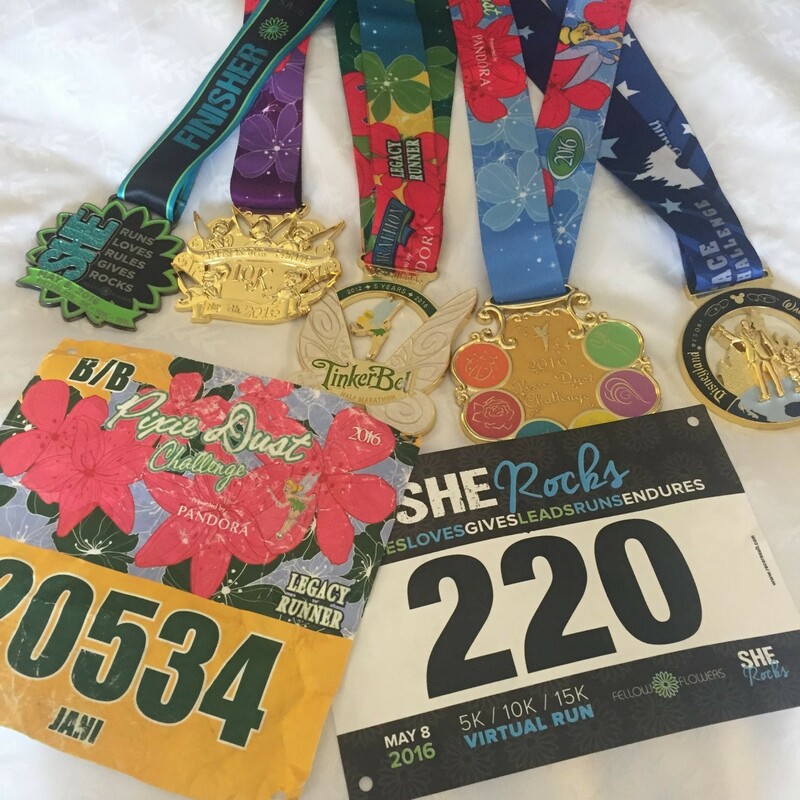 This race also racked up some serious bling, especially since I’d also signed up for the virtual She Rocks race and used the half-marathon to complete the distance. 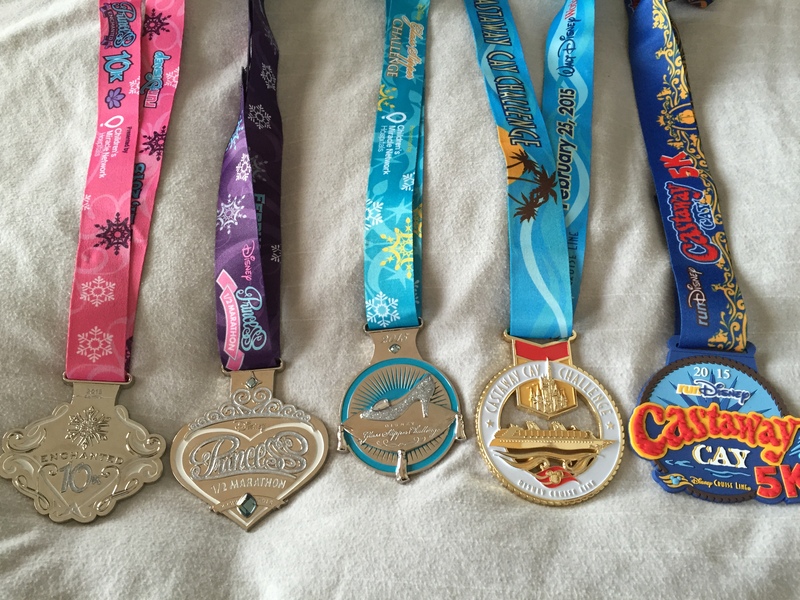 The medals are (left to right): She Rocks, Tinkerbell 10k, Tinkerbell Half Marathon, Pixie Dust Challenge and Coast-to-Coast (for completing races in Florida and California in the same year). 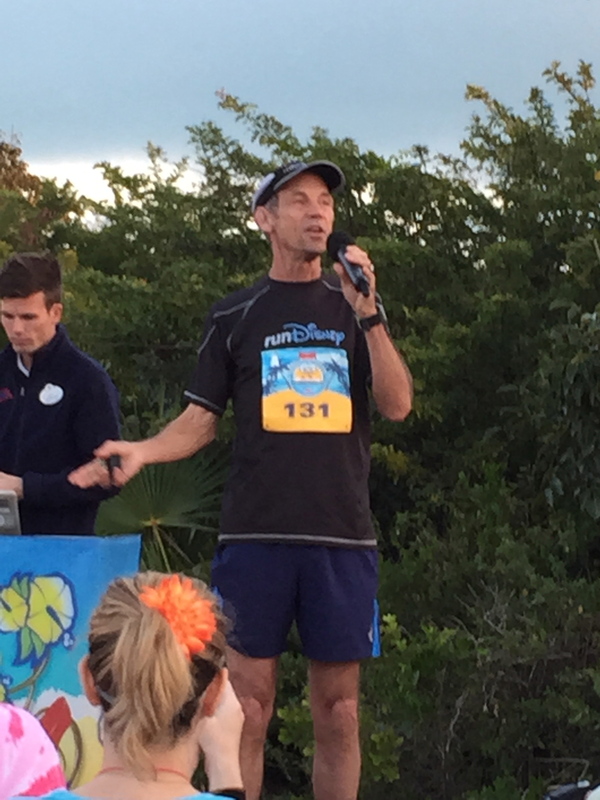 Not counting Castaway Cay 5ks, I’ve now completed 16 Run Disney events. It feels slightly dorky to admit that, but hey! There are worse habits to have. 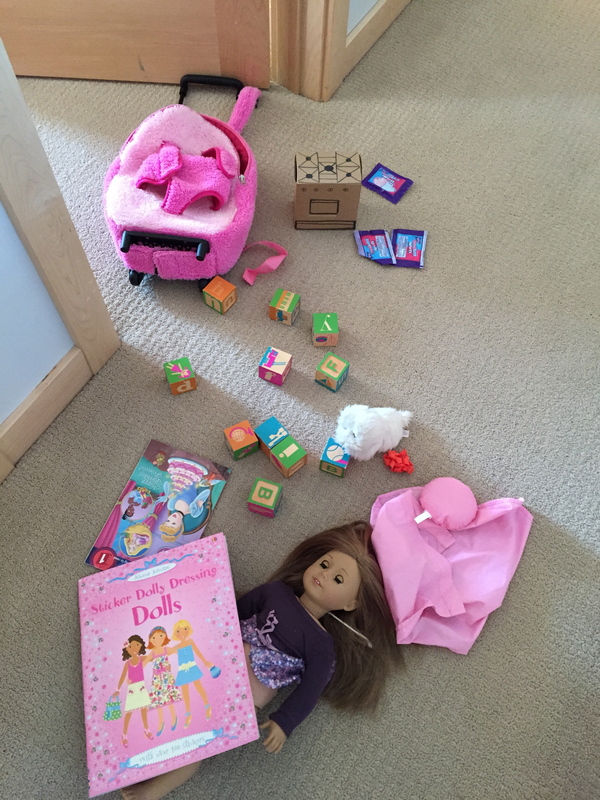 I’m pre-packing two bags today for a complicated trip I’m taking this week. After work on Tuesday, I’m heading to Dubai for a conference. With multiple time zone changes and a brief layover in Europe, I don’t arrive until nearly midnight on Wednesday, which leaves me just enough time to sleep before the conference starts Thursday A.M.
Friday brings more of the conference and an 11 P.M. outbound flight, where I then head to Orlando via Atlanta, with a plan to arrive in Florida at noon, meet spouse at the Swan Hotel and hopefully make it to pick up our Wine and Dine Race Packets and run the half marathon that starts at 10 P.M. and ends in EPCOT, finishing with an after party that goes until 4 A.M. The rest of Sunday is scheduled for absolute crashing and the two of us will head home Monday. Miles tally = nearly 25k when it’s all said and done. Since there are two distinct parts of the trip, I’m planning to carry-on only for the Dubai leg and (politely) ask Spouse to share a bag that he will bring to Florida. 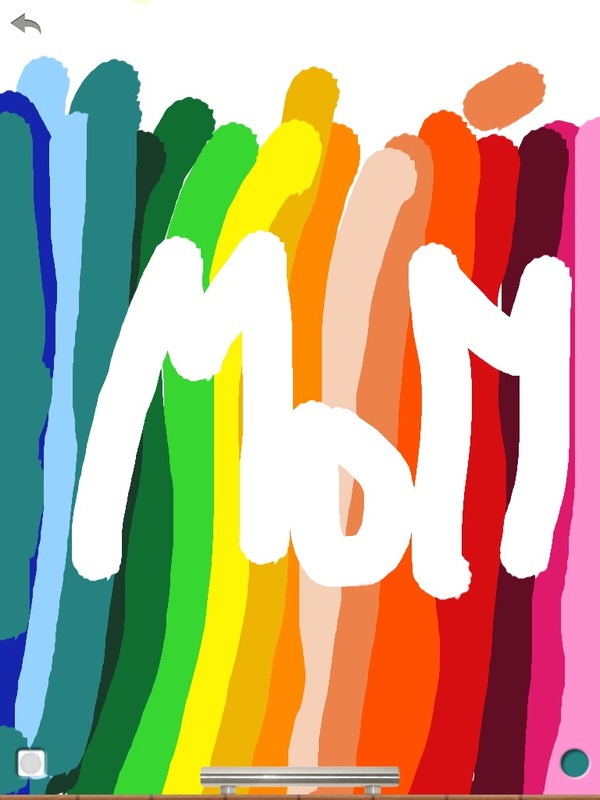 For the conference in Dubai, I’ll pack M.M. LaFleur dresses (this one and this one), my two trusty pairs of heels, and blazers to go with the dresses since the environment is formal. My time there is so limited that I’ll bring one extra outfit for dinner or an excursion but that’s about it beyond basics like PJs and my toothbrush. Florida’s a different story. 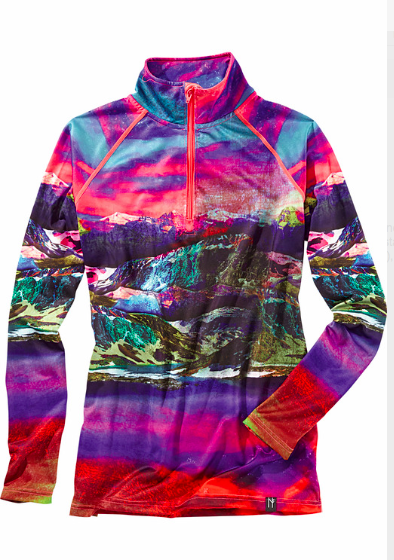 I feel like I need a few options for the race (last year was reportedly freezing cold and rainy – please don’t let that happen again! – and many runners didn’t plan for those conditions), plus something to wear to the after party. Research about the party shows that almost everyone brings a spare outfit in their checked race bag, since partying in soggy, stinky race gear is just unpleasant. Like most races, Run Disney ones are very specific in that you must use the clear bag they give you at packet pick up as your check bag. Advice from past participants suggests tucking a small backpack into that bag for later use, since the check bags are pretty flimsy. I also specifically booked a hotel in the EPCOT area so we can leave the party via the (secret) International Gateway and walk the half mile or so back to the hotel after the party without too much hassle to get some needed ZZZZZs. Yes, this is a complicated trip with a lot of pieces that need to fall into place, but I’m hopeful that they will. 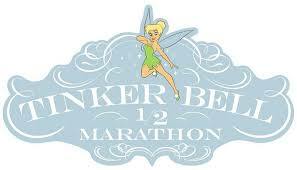 Yesterday registration opened for the 2016 Tinkerbell Half Marathon Weekend, which is slated for May 5-8, 2016, at Disneyland. I really wanted to participate again in this race, since it’s the Fifth Anniversary and I’d be five-for-five in running. 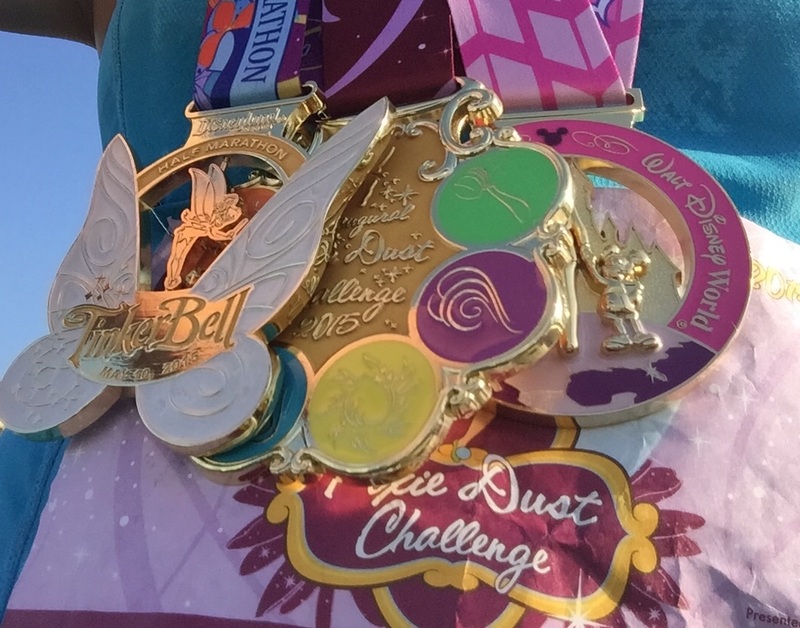 I also wanted to do the Pixie Dust Challenge, which is where you run a 10k one day and a half marathon the next. But here’s the problem: Run Disney races have become so popular that they usually sell out, and quickly. Case in point: the 2015 Wine & Dine Half Marathon sold out in a scary half hour. I managed to secure two spots in the Wine & Dine for Spouse and myself, but it involved setting a reminder alarm, panicked screen refreshing, etc. So yesterday I was prepared for the worst. With a full roster of A.M. duties, I tried to efficiently pace my day so that I could carve out a niche of time right when registration opened at 11 A.M. Central. At 11:01, I was at my computer and headed to the Run Disney site. I was prepared for what happened next, which is that I was directed to a queue to register. Sometimes this queue takes up to 20 minutes, and you need to be ready when it’s your turn. I was in line less than a minute, though, and quickly got directed to the registration. By 11:03, I was in the Pixie Dust Challenge. Score! Curiosity got the best of me, though, so I kept refreshing the registration page during the day. By 11:30 A.M., the Pixie Dust Challenge was 70% full. By 11:50 A.M., the Pixie was 75% full and the half marathon by itself was 50% full. The 10k was 70% full. Day’s end showed the Pixie at 80% full and the half marathon still clung at the halfway mark. Today, the Pixie is at 85% capacity, the half is still at 50%, the 10k is sold out, and the 5k is 99% full. The kids’ races are sold out. Sign up for a Run Disney email reminder. They’ll send you a message about a week out from registration. Set multiple alarms and reminders for registration. Go to the website early and keep refreshing until registration opens. Sign up for an Active.com account ahead of time (it’s free), so the entry can be pre-populated with some of your information (address, age, etc). This considerably speeds up the registration process. Don’t forget your Active.com password! This happened to me once and it took several attempts for me to get it right. This time, I was ready. Have your credit card in hand. They want payment at the time of registration. Follow Run Disney on social media sites like Facebook and Twitter. They’ll often have extra reminders there, too. Consider buying an annual pass to Disneyland or Walt Disney World. 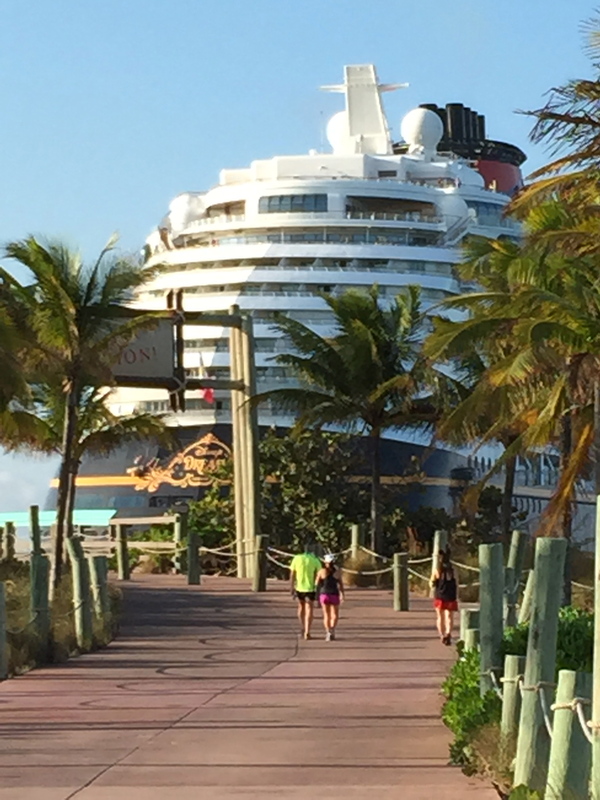 Annual passholders and Disney Vacation Club members get a two week head start on registration. Lucky them! 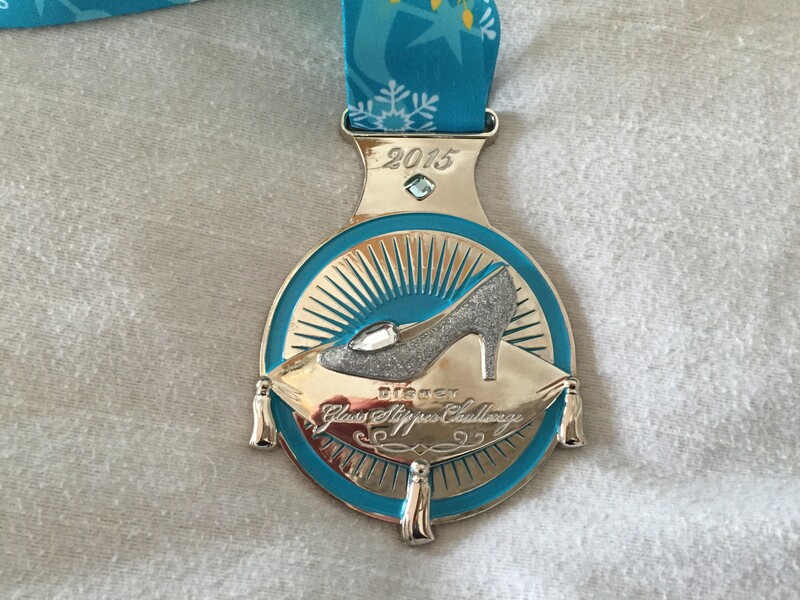 Yesterday – Mother’s Day – I completed the inaugural Pixie Dust Challenge, a two-day, 19.3 mile event from Run Disney. Event one was a 10k on Saturday morning, followed by a half-marathon on Sunday. Earlier this year (February, to be exact), I did a similar thing in Florida, so I felt like I had the drill down. Just like Florida, Saturday was colder than Sunday, less crowded, and overall, I liked the 10k courses better than the half-marathons. It’s easy to see why, though: by the time you realize you’re running, you’re well into the 10k, and then it’s over before you know it. 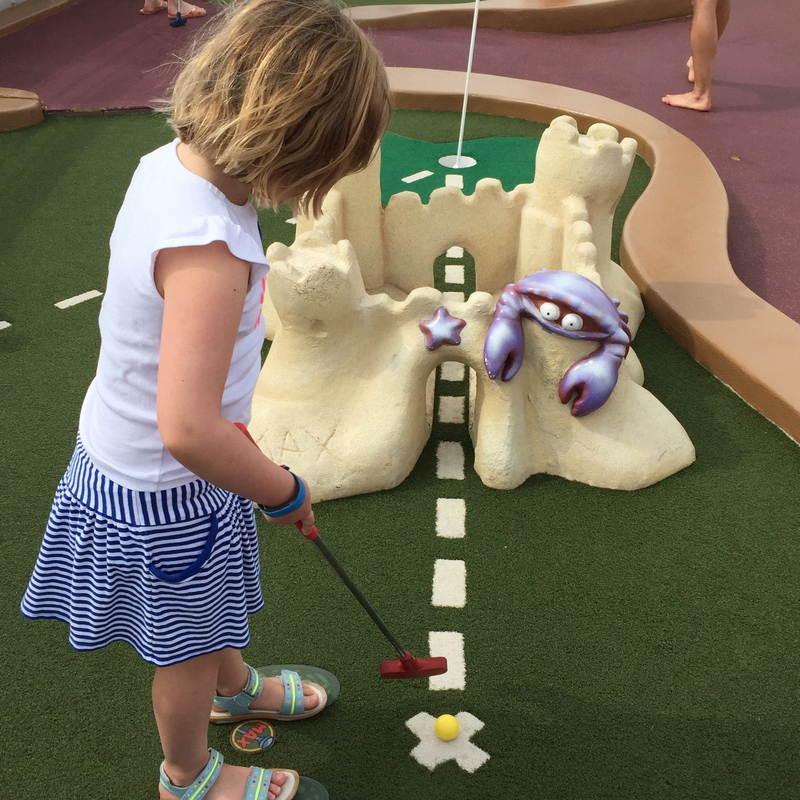 Since the course is shorter, there’s also much more running time within the theme parks than in the surrounding streets, which of course is a lot of fun and a great distraction. I didn’t check my official time yet, but my watch said my 10k time was 57:29, which is pretty typical for me. I could have gone a bit faster, but I was nervous that I could flame out on Sunday if I went out too hard on Saturday, so I held back a bit. Here’s a shot from the starting area at 5:30 AM Saturday, plus a post-race nap I took in front of a fire in the lobby of the Grand Californian hotel (20 minutes of heaven). On Sunday, I felt better than I expected. The course is honestly a bit boring in the middle and I’d planned to take a short walk break around mile 8 if I needed it, but I didn’t. Soon I saw miles 8, 9 and 10 tick away. When I got to 11, I knew I would be done in less than twenty minutes, so I kept moving forward. Again, I didn’t check my official time, but my watch said 2:05 when I crossed the finish line. I felt strong. And on to the bling! I actually got four medals this weekend, but you can only see three above. 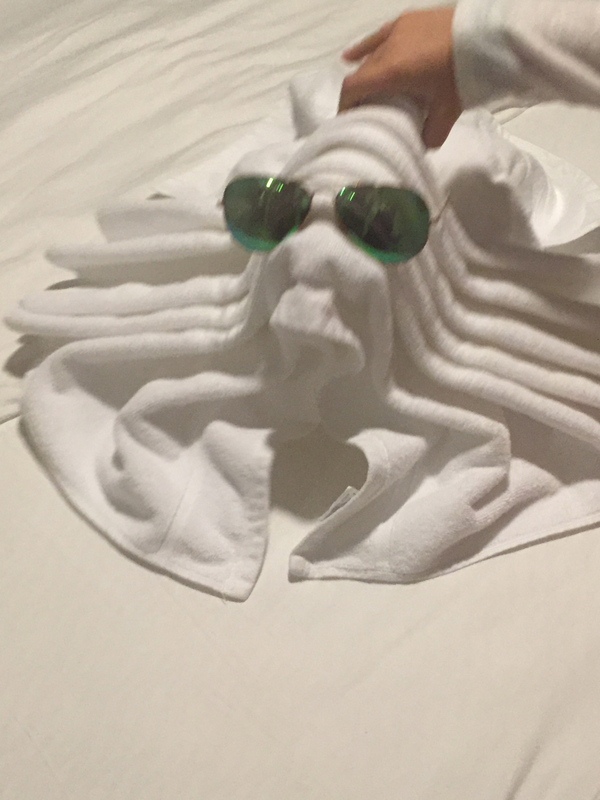 I left the 10k one in my hotel room. After finishing the half-marathon, I got the medal for that (far left), one for the Pixie Dust Cahllenge (middle), and then a Coast to Coast one (pink, on right), for completing half-marathons in both Florida and California in the same calendar year. The middle one was my favorite! But, the truth is that while I loved participating in these races and felt strong – which I think is really critical to share with my kids – I missed them terribly. I made a mistake in not bringing them with me, especially since it was Morher’s Day. That fact was poignant and I was envious of other women whose kids were cheering for them and hugging them in the reunion area. I’d like to rectify this next year, if possible. P.S. 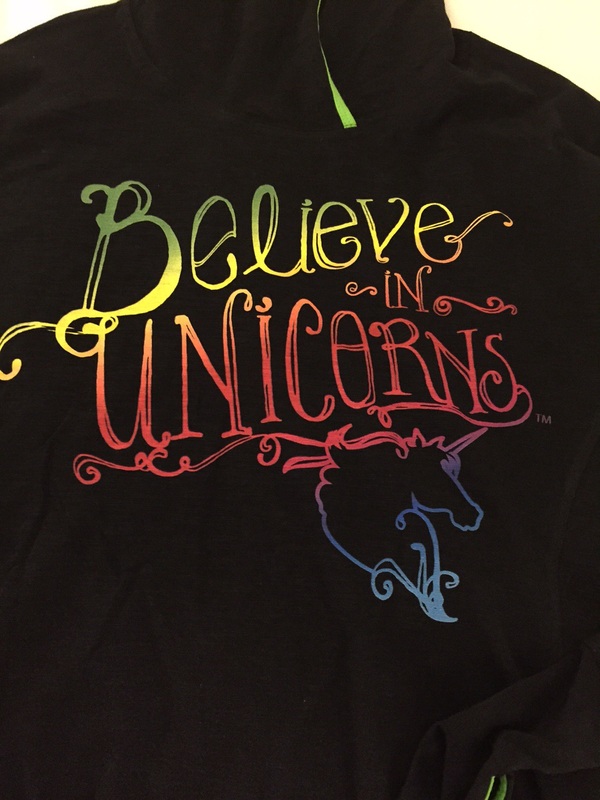 I bought this rainbow unicorn hoodie from Raw Threads because, well, it’s a rainbow unicorn and totally hilarious. Also, I was cold! 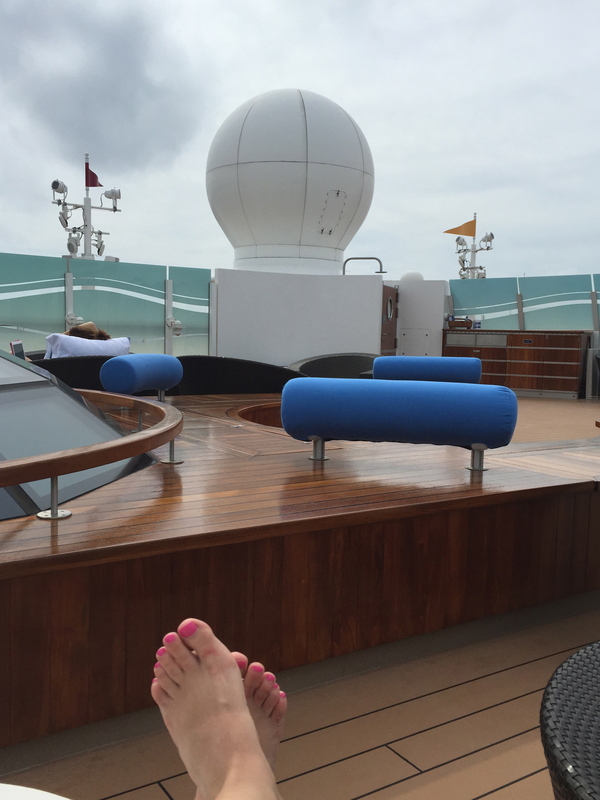 Recently I posted that my sister and I were heading out on a two-part trip with my kiddos. And I’m happy to report that there were no major mishaps and she still seems to be speaking to me, so I’ll chalk that up in the win column. I vetoed all of this. 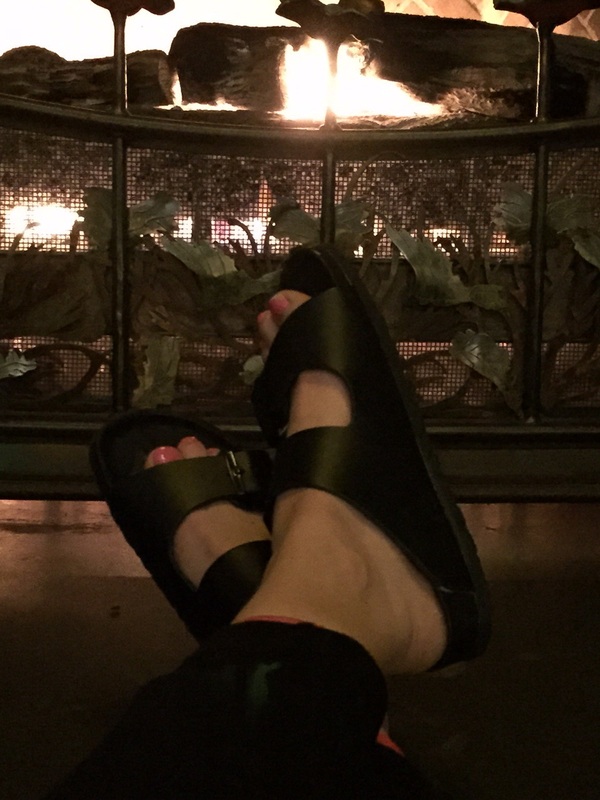 We arrived in Orlando on February 19th and checked into the Swan Hotel. We had a newly renovated room and there were balloons, a card and a birthday button for Trixie waiting for us. She was so excited. I was planning to run a series of races that started on Saturday with a 10k, a half marathon on Sunday and then finished with a 5k on Wednesday. There was a cold snap in Florida last week and Saturday’s race started with temps in the 40s. This was the second year for this 10k race, and the course is awesome, winding through EPCOT and the Boardwalk hotel area. The cold temps made for fast conditions. I felt great. Sunday was slightly warmer (50s) and not as humid as last year. The miles zipped by, and while I didn’t set a PR, I felt good the whole time and finished strong. 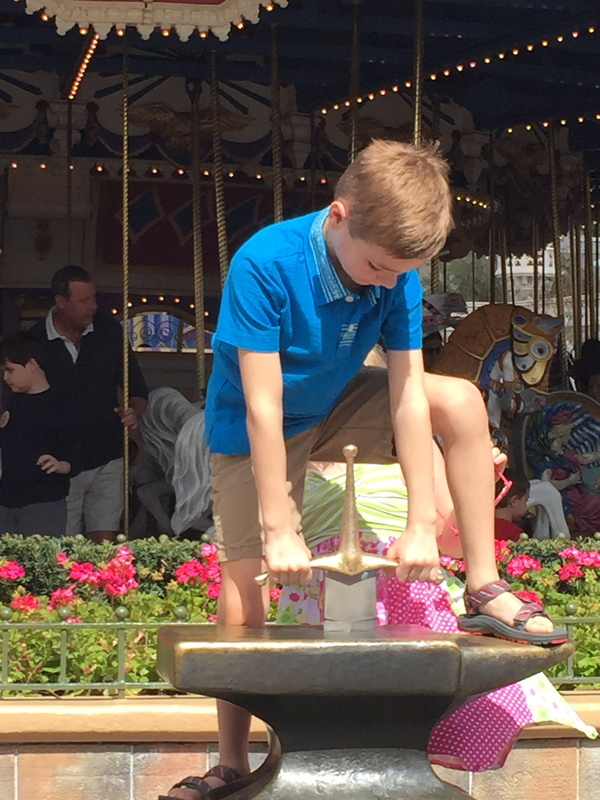 I was tired but we decided to hit the Magic Kingdom on Sunday afternoon. 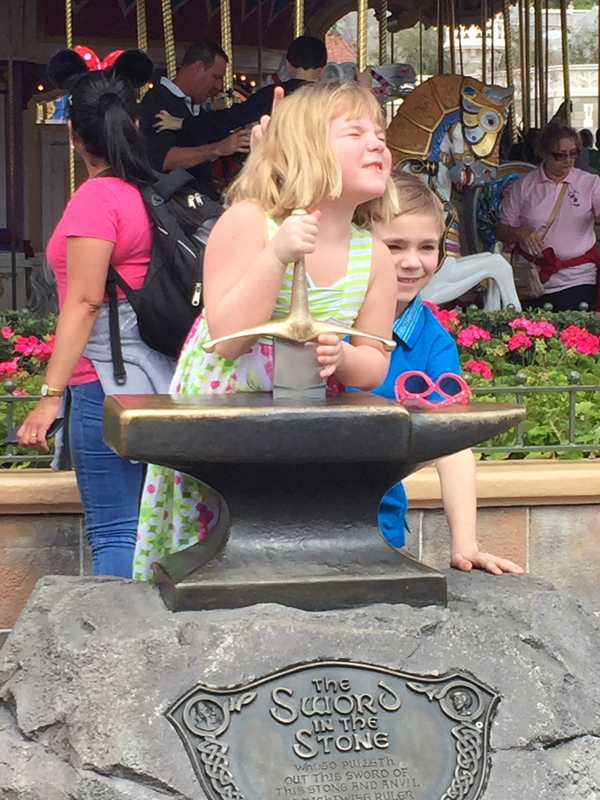 Both kids tried to pull the sword from the stone in front of the carousel in Fantasyland. 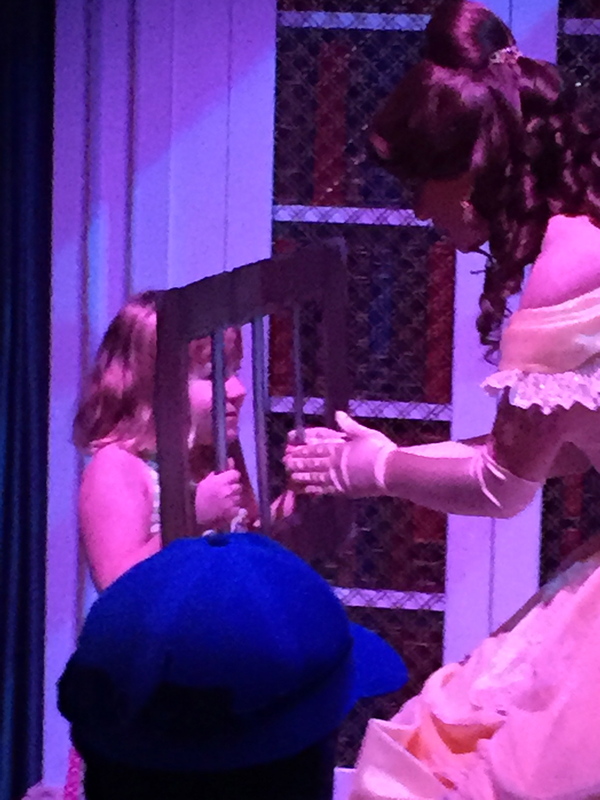 We also went to a great new attraction called “Enchanted Tales with Belle.” This was actually a very interesting experience (detailed in this Slate article from late last year), and Trixie got to play Belle’s jailed father and meet Belle. 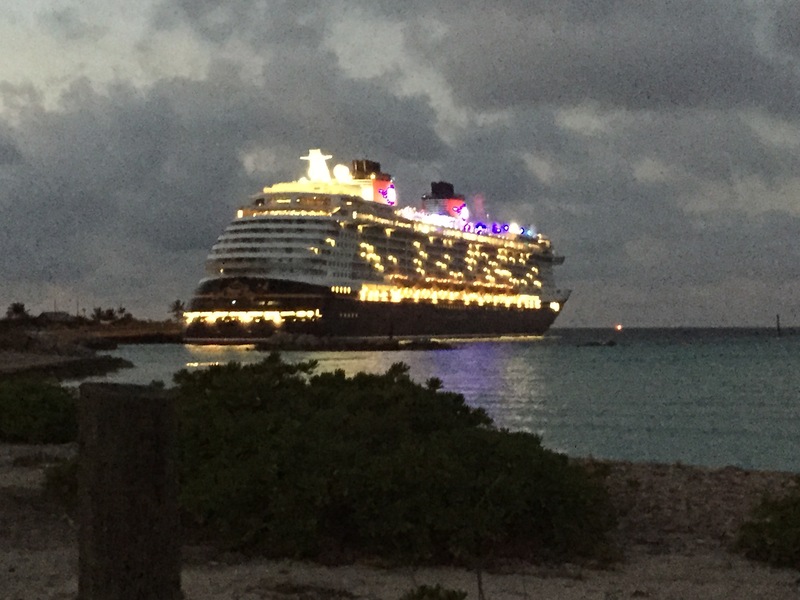 On Monday we boarded the Disney Dream for a four night cruise to the Bahamas and Disney’s private island, Castaway Cay. 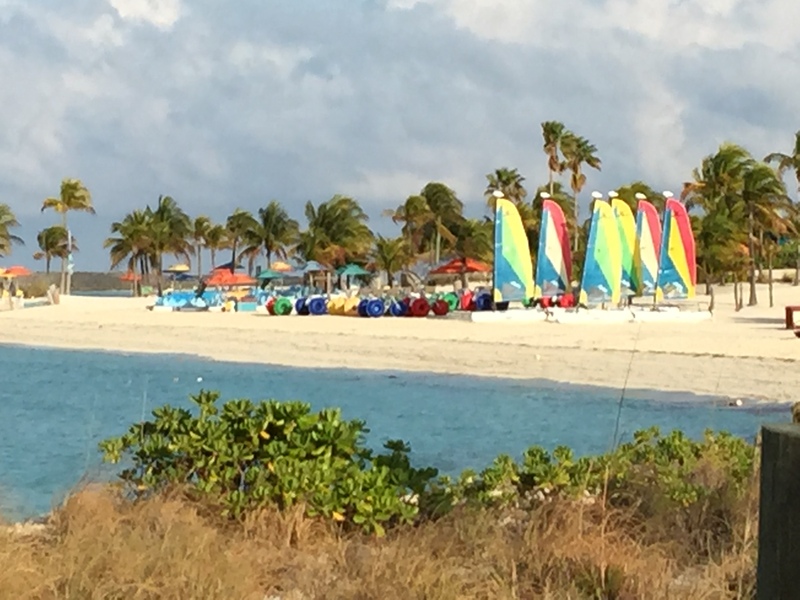 With any cruise that stops at Castaway Cay, there’s always a 5k race in the morning. Anyone can participate and there is no entry fee, and while you get a finisher’s medal, it’s not fancy. 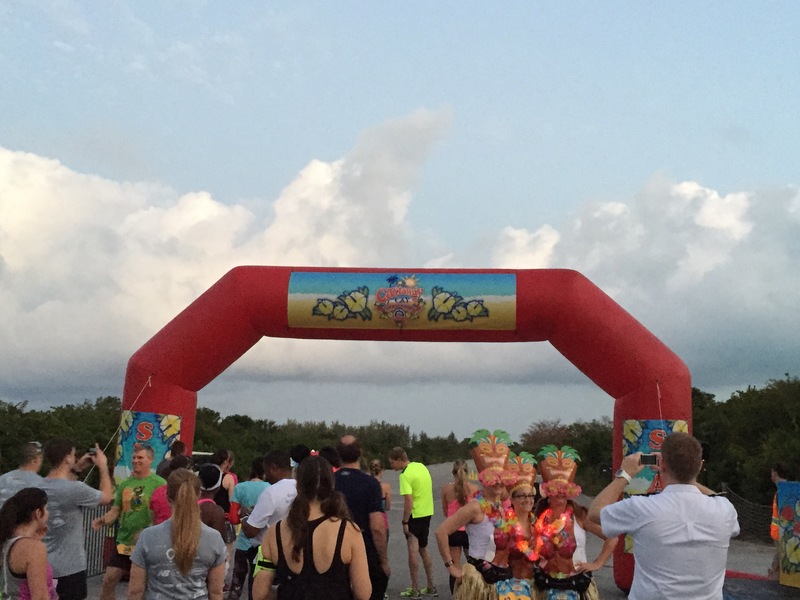 This race was different; in order to participate in the Castaway Challenge, you had to have run at least one of the other Disney races the prior weekend and the race was capped at 400 runners. 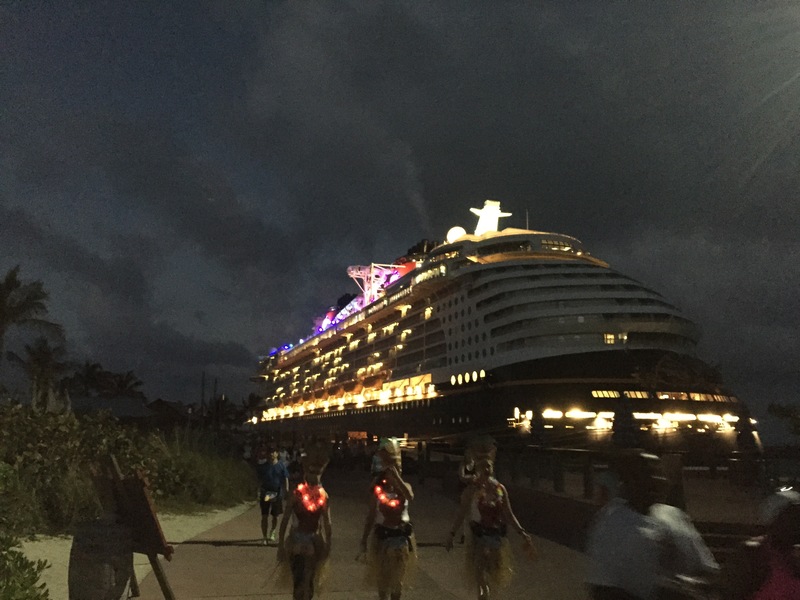 All of the runners met at 5:45 AM and got to be the first passengers off the ship. It was still dark and we got to see some great views of the boat. My original plan was to just slowly jog the 5k, but once it started, I felt like I was ready to push myself. Although there weren’t official results, I was #17 overall with a time of about 25 minutes, which was ok with me. I was super happy in this shot. We came home to some stark winter reality with temps in the single digits, but it was totally worth it.